This is our moment. This is our movement. Post by Armenian Youth Federation. Over the past 100 years, the Republic of Turkey’s government, through denial and suppression, has led a full-fledged assault against recognition and reparations for their crimes during the Armenian Genocide. The Armenian Genocide that started in 1915 was not a byproduct of war, it was not a western form of relocation, but instead, a systematic and tactfully planned effort by the Young Turk regime to annihilate the Armenian people. Today, January 14, the Armenian Youth Federation will begin the 100 Days of Action leading up to the centennial of the Armenian Genocide. It is most appropriate to begin the 100 Days of Action on the 82nd anniversary of the AYF’s founding. With a legacy of over 80 years of community involvement, the AYF stands prepared to play a leading role in the preservation and advancement of the Armenian people and cause. The generations before us were willing to die on their feet rather than live on their knees. As the continuation of the Armenian people and inheritors of a legacy of activism, the AYF assures the community that we understand the duty bestowed upon us, and we will continue to fight against the challenges that are put forth. Knowing full well that our people’s future rests in the hands of an active Armenian youth, we realize the sacrifices our ancestors made for us. This, in turn, has sparked a passion in each of us to work willingly and tirelessly for something that is much greater than ourselves. For nearly 100 years, we as Armenians have seen the Republic of Turkey’s government push a politically motivated campaign of denial. History has been carefully and intentionally excluded from textbooks, social media and the memories of the people of Turkey. Denialists funded by Turkish lobbyists have been touring the world, spreading their lies about our history. We as Armenians have been taught about the forced hardships that were brought forth on our grandparents, great grandparents and ancestors. We have heard their aching cries as they spoke of the atrocities that took place in their homes, on our indigenous lands. They have taught us of the six historically Armenian regions of Van, Erzerum, Kharpert, Bitlis, Dikranagerd and Sepastia-Sivas, which have been stripped of their native inhabitants by virtue of the Armenian Genocide. We as Armenians have put our faith and hope in the hands of our “fearless” American leaders. We have allowed for them to make their way into office with their empty promises. We have patiently waited year after year for justice while hoping that one day one of our so-called leaders would carry out their promise and recognize this genocidal crime against humanity as a moral and ethical obligation. We as Armenians are done waiting and are tired of asking. This genocide is not any less significant than the ones that are taking place today. The pursuit of moral and material justice does not have a timeline; it does not have an expiration date. It is founded upon the truth that the Republic of Turkey’s government and American politicians have been hiding from for nearly 100 years. It is our time to fight back and demand what is right. Over the next 100 days, we will be educating, we will be making classroom presentations, we will be working with school districts and museums in order to teach the public about the history that has been left out of textbooks. We will also be organizing divestments, boycotts and protests in order to make sure our demands are heard. Over the next 100 days, we will be introducing to the world the stories that we were told as kids. We will be sharing the painful truth that took years for our great grandparents to finally speak of. We will be establishing a relationship between our community and the scholars, writers, artists, politicians and religious figures that were slaughtered in April of 1915. We will share their stories and make sure that they will never be forgotten. Most importantly, we will show the world that the attempt at annihilating the Armenian people was not a success. 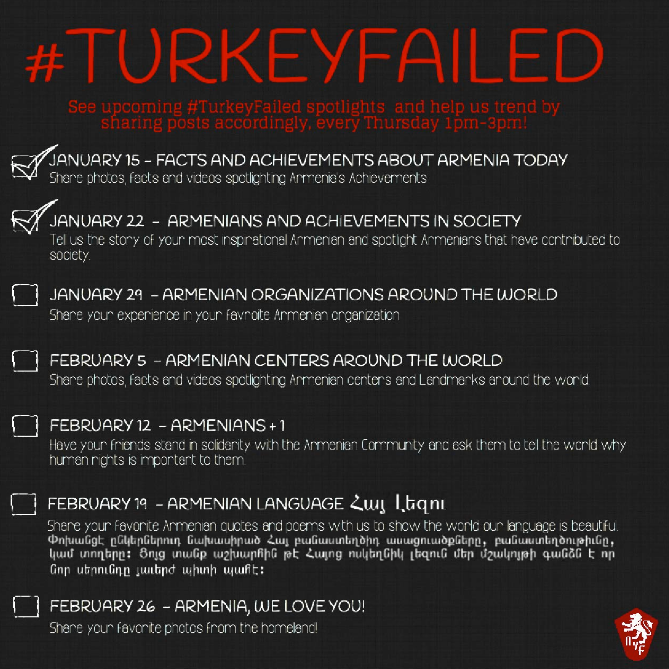 We will spend the next 15 weeks spotlighting our history, our achievements, our organizations, our projects, our Armenian centers around the world and our beautiful language and culture, proving to the world that TURKEY FAILED because WE SURVIVED! Over the next 100 days, we are calling all Armenians in all communities to action. We are not waiting for today’s political figures or tomorrow’s presidents to step into office and use their empty promises as a tactic for their own political gains. Instead, we are starting a movement. This is our history. Those were our ancestors that were massacred. This is our time to show the world that 100 years is nothing but a number. No matter how long it takes, we will create the justice we deserve. This our destiny to shape, together. Today, January 12, marks the birthday of Aurora Arshalouys Mardiganian, a survivor of the Armenian Genocide. Mardiganian was an Armenian-American author and actress. She was born in 1901 and raised in the city of Harput in the Ottoman Empire. After witnessing the murder of most of her family during the genocide, she was kidnapped and sold as a slave. Eventually, she was able to escape to Tiflis (Tblisi, Georgia), where she stayed in Hovanes Toumanyan’s home. From there, she went to St. Petersburg at the same time the Bolshevik Revolution was occurring. She then made her way to Norway, and finally to the United States with the help of the Near East Foundation. When she arrived in New York, she was approached by a young screenwriter who helped her write and publish her memoir titled Ravished Armenia. The narrative was used for a film script that was created in 1919, in which Aurora played herself. Mardiganian admits that as much as the film tried to portray her stories, the horrors she had faced were alleviated in the film because they could not show such horrific things. Mardiganian became a spokesperson for the victims of the genocide. She lived the rest of her life in Los Angeles, where she passed away in 1994 at the age of 93. During the 100 Days of Action, Tuesdays are going to be dedicated to survivor stories like Aurora Mardiganian’s. Social media campaigns with the hashtag #TurkeyFailed will follow on Thursdays throughout the 100 days. Together, these two actions will demonstrate our people’s resilience, courage and bravery. Survivor stories illustrate the atrocities and pain our ancestors endured in the first half of the twentieth century. They demonstrate the past generations’ will power and determination to maintain their Armenian identity and preserve their language and culture. Most importantly, these stories prove that we survived and we flourished. Our mere existence is a testament to Turkey’s failure. Its failure to erase us. Its failure to cover it up. Because we prevailed. We’re still here 100 years later, and we’re ready, we’re standing, and we’re mobilized. The 100 Days of Action will begin in just 2 days. We ask that you join our movement and support our efforts to make our voices heard. For more information on the 100 Days of Action, click here. 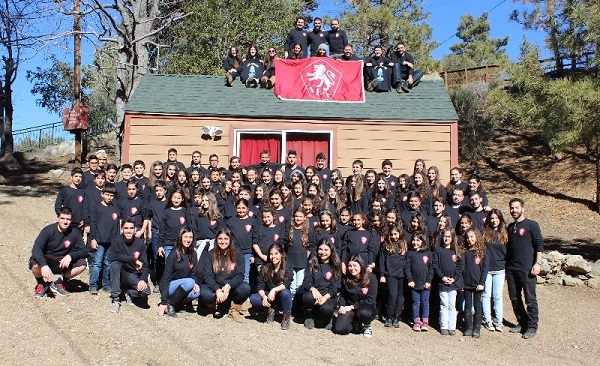 GLENDALE, Calif — The Armenian Youth Federation – Western United States has announced the 100 Days of Action, a campaign to mark the centennial of the Armenian Genocide. The 100 days will begin on January 14, the anniversary of the founding of the AYF, and will conclude on April 24, the day marked as the start of the Armenian Genocide. The AYF will host daily actions throughout the 100 days, including weekly social media campaigns, boycotts and divestment, political lobbying, tactical demonstrations, cultural displays, and educational forums. The 100 Days of Action will culminate with a march leading to the Turkish Consulate in Los Angeles on April 24. 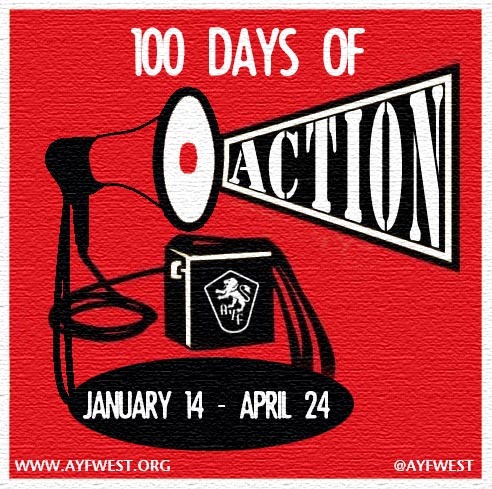 Information about each day’s action will be available on www.ayfwest.org and across social media outlets (@ayfwest). Those who wish to participate can contact the AYF at 818-507-1933 or ayf@ayfwest.org.